My last few posts I have been talking about Australian domestic flying, so let's mix it up a bit and have a quick look at a flight I took 2 months back from Ho Chi Minh to Siem Reap, probably one of the most expensive 45 minute flights I've taken in my life at almost $200 one way! They sure know how to rip off the tourists heading for Angkor Wat!! I doubt many locals would pay that, most would take the bus. Ho Chi Minh City has quite a large and modern international terminal which is airy and easy to navigate. I arrived at the check-in desks and joined a queue. After a while standing in the queue I was suddenly approached and told that my queue was closing and I should join one of the other (much longer) lines. This is NOT how you manage a queue, you close the line at the end and advise any newcomers the queue is closed. You do not tell someone who is well established in the queue to join another. I expressed my dissatisfaction and the staff relented and processed my checkin without further fuss. Not a good first impression though. As you can see in the photo above there are huge windows facing the tarmac with great views of the aircraft waiting. With no lounge access for me I headed for a small food court and had Burger King for dinner. Once that was done it was time to head downstairs to our departure gate. Our aircraft was going to be leaving from a remote stand so the gates we waited at were bus gates. Eventually it was time to head for the bus and onwards to our aircraft. Interestingly as we approached I realised the aircraft was painted in Cambodia Angkor Air colours. Vietnam Airlines owns 49% of Cambodia Angkor Air and they seem to share their fleets. Once onboard the flight attendants and seat pocket materials were all featuring the logo of Vietnam Airlines. Today's service was being operated by VN-A327, a Vietnamese registered Airbus A321-200, quite a new aircraft being only 2 years old at the time of the flight. The seating configuration was 168 economy and 16 business, quite spacious really. Have you ever wondered what my knees look like? They have made a very rare appearance in the photo above, I am normally strictly a jeans wearer when flying but on this flight I wore shorts. As you can see, leg room was decent. It was already dark outside by this stage and we made a quick taxi to the runway and took off into the night sky. I had a nice view looking out my window of the city outside before climbing through a cloud layer and into the clear skies above. Considering the inflated prices being charged on this flight a small snack would have been more appropriate in my opinion. Other airlines can easily achieve that even on a 40 minute sector. The flight was quite smooth and before long we were on descent into Siem Reap, there was nothing much to see outside other than darkness, it seems the area is quite rural. Eventually the lights of the small city of Siem Reap came into view and we made a smooth touchdown. As we arrived I noticed a Vietnam Airlines Fokker 70 leaving for Hanoi, I was a little disappointed I had not booked to come in on one of those as I have never been on one and there are not many operators left. Disembarking was through the forward stairs amd it was a short walk to the terminal with no bus required. The airport was very efficient and we were through customs and had our bags within a very short period of time. My driver was waiting outside and we were soon being whisked away to our resort. Overall an efficient flight but way overpriced for what it was. 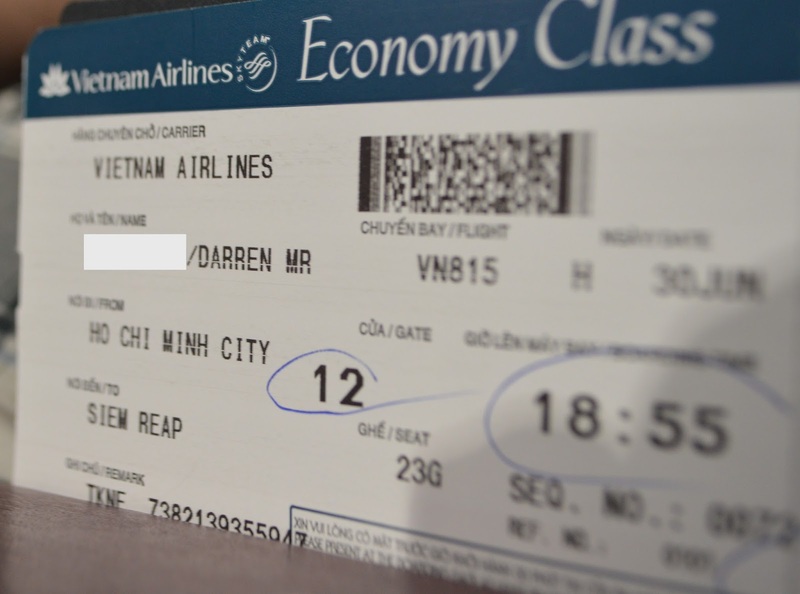 I too have flown on a Vietnam Airlines flight where the aircraft was a Cambodia Angkor Air, domestically from Danang to Ho Chi Minh City and what fascinated me the fasten seat belts signs in Engligh, Vietnamese and Cambodian! Great report. I love seeing how all of these airlines outside of the US look and operate. Thanks! Knees AND a little bit of calf action too! I'm flying vietnam airlines next year from Hanoi - Laos and this was a great little insight for me. I've picked flying over the 24 bus ride as my alternative.